A Christian gift book about hope! Looking for a Christian book as a gift? Buy this Christian gift for friends and family! The perfect gift is a Christian book about hope! Click here to see inside! Uplifting stories! New perspectives! Scripture! Share hope! CLICK HERE TO BUY CHRISTIAN BOOKS! and we share this journey with God. Hope is the one thing in life that we cannot live without. In the Bible, Jesus commanded us to love our neighbors as ourselves. For every person we touch, we leave a small handprint on their heart. 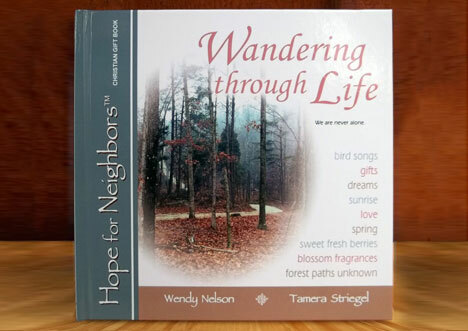 "Wandering through Life" is a 48-page, 8-1/2" x 8-1/2" hardcover Christian gift book filled with inspirational stories and more! Jesus told us to love ourselves, our God and our neighbors. This is the perfect Christian gift to reach out in love, share hope and encourage others. The quality images feature beautiful color photography. 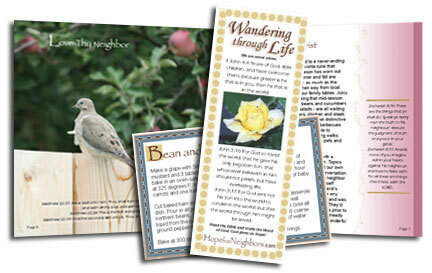 Poems, articles and stories motivate us to learn a new way of living - using our gifts and studying God's Word. It includes recipes, helpful hints, a bookmark and verses of KJV scripture. Buy this Christian book for friends!The Study Guide is now available and is shown below! Your Christian online store! Christian book about hope! Perfect for group study, ladies' Bible study or Sunday school studies as you put into practice the concepts highlighted in the hardcover book! This is a motivational Christian study guide. 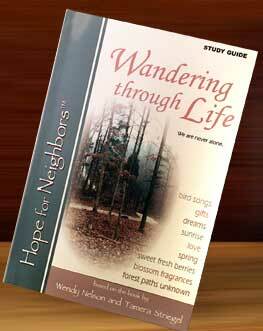 BUY your Wandering through Life Study Guide today! Looking for a Christian Gift Book? and with all thy mind. WHERE TO BUY - CHRISTIAN BOOK! Like us on Facebook! Latest Blog News! Christian Gifts Products! Read the Word of God in the Bible! Learn to feel joy and hope! dialogue, and debates, as well as fellowship. Buy the book for Christian friend! All rights reserved. No part of this web site may be reproduced. Buy this Christian book for friends and family! It is the perfect gift!